Last year we set out to help our readers succeed in their low carb diets. Too many ingredients and too much of a time commitment to stick with daily. Having a giant shopping list and looking for uncommon ingredients is annoying and discouraging. Most diets and plans have you under eat calories and leave you hungry after every meal. The worst part is, the food is bland and not something to look forward to. The hardest thing for me when dieting is feeling like I'm eating "diet food" – gross. So when I tried the recipes in this ebook I was so surprised! Each one was flavorful and juicy… I completely forgot that I was cutting carbs! Not only did I lose 5 pounds in the first week, but I felt amazing. I never felt bloated after dinner like I usually did and I had so much more energy than I did while eating low-fat! I love that this book has delicious unique recipes. I tried a few things I never have before and ended up loving each one! All of the recipes really only have 5 ingredients so I was making a different meal every day and enjoying each one. So far everything is sooo delicious… even my picky eater and husband munch happily with me! Thank you!!! I started the ketogenic diet after my doctor told me my cholesterol was very high. This book really helped ease me into it since there were only a few ingredients for each recipe. 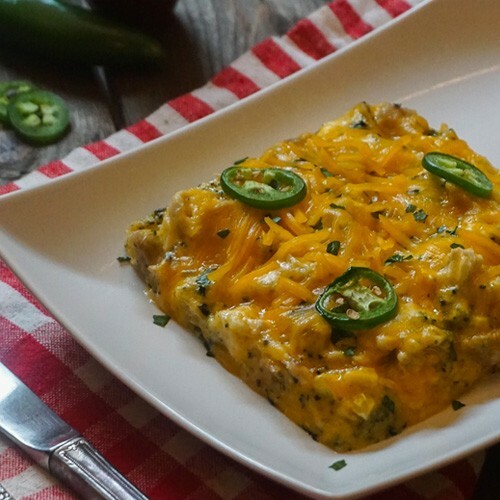 It's hard to find low carb recipes for beginners that aren't completely boring. These recipes made me feel like I was eating restaurant quality meals for way less money and time in the kitchen which is exactly what I needed. 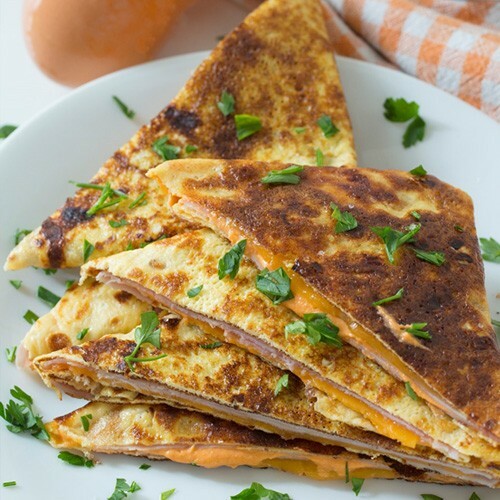 I've been eating these low carb recipes for the last 2 weeks and am totally blown away by how tasty each one is. 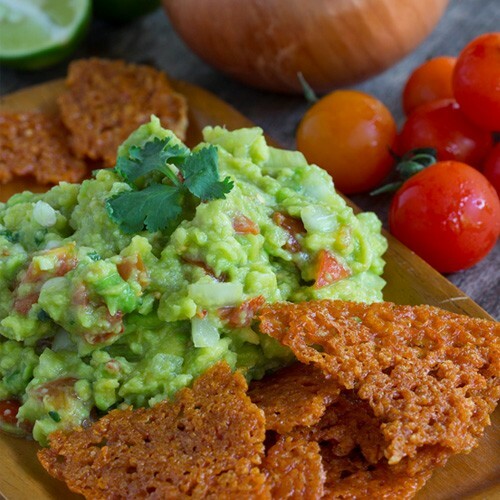 The fact that they're only 5 ingredients and a lot even have a side dish is mind blowing. I honestly feel like Keto in Five series is the best investment I've made in my low carb diet (outside of my Costco membership of course). The best part is I've been steadily losing weight, about 7 pounds in 2 weeks. 30 low carb lunch recipes all using just 5 ingredients and 5 net carbs or fewer! Succeeding in your low carb diet has never been easier. Lunch is often difficult to make interesting and delicious due to work and time. That's why we created 30 unique recipes that are perfect for on-the-go or home that will surely blow you away! 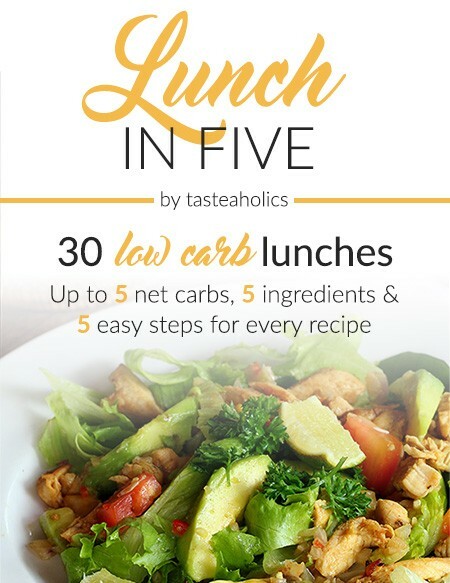 Lunch in Five is a month’s worth of simple, delicious, low carb (keto) lunch recipes that are each made with just 5 common ingredients and are up to 5 grams of net carbs! There’s nothing better than that. 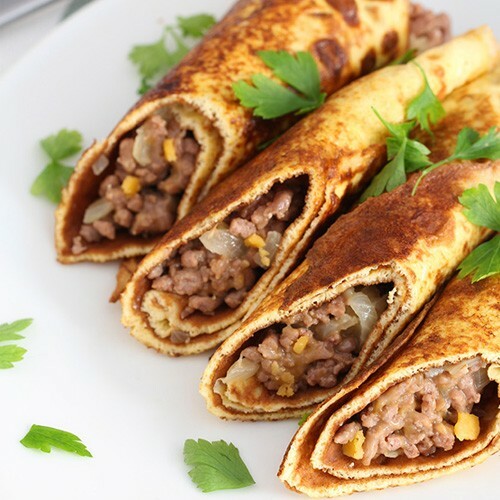 Enjoy savory french crepes, creamy chowder, mouthwatering casseroles and much more every day of the month. Living a low carb lifestyle has never been more enjoyable and sustainable! 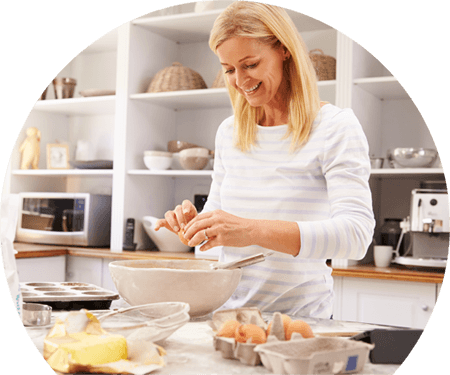 Discover being low carb the easy way. You can count the carbs in each lunch on one hand! Go ahead, have seconds, you'll still be within your daily carb limit. Cutting down the amount of ingredients reduces cost, time, complexity and even the willpower needed to start cooking. Calculating your daily calories and macros is crucial to hitting your goals sooner. We calculated each recipe so you don't have to. Have a general question about the low carb diet or something specific about one of our keto lunches? Email us directly anytime! If you're not satisfied, get your money back! Your satisfaction is 100% guaranteed! We stand behind our products and believe you will benefit from them greatly. 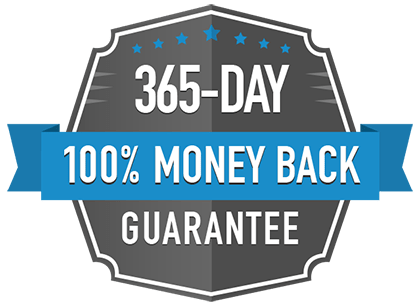 However, if for any reason in the next 365 days you decide Lunch in Five (or any of our other Keto in Five ebooks) isn’t for you, just email us and we’ll refund you 100% of your money, no questions asked. It's that simple. 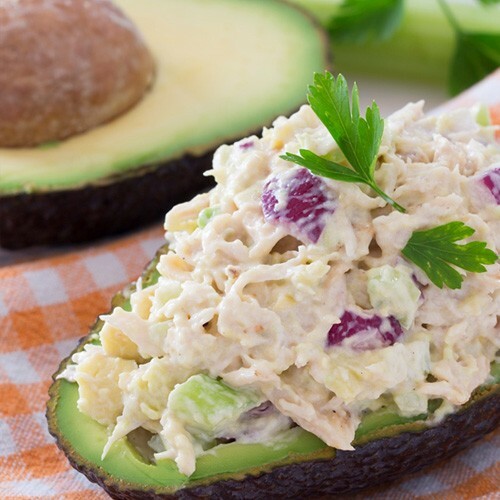 Get our Lunch in Five ecookbook and start your weight loss journey today! For a limited time, get Lunch in Five for 33% off! Click Here to Get Lunch in Five! I wish I had these easy low carb recipe collections back when I was just getting started on the keto diet. It was tough for me to find simple recipes to get through the day. Try Low Carb makes it easy. I highly recommend the Breakfast, Lunch, Dinner & Dessert in Five eCookbooks. If you’re into flavorful 5 ingredient recipes that are easy to prepare, this eCookbook series is for you. Vicky and Rami keep the focus on simple, standard ingredients and basic cooking techniques – ensuring that even those with crazy time constraints and rudimentary cooking skills can stay on track. The Keto In Five cookbooks are all about minimalism. The concept is brilliant: every single recipe has five ingredients or less and five net carbs or less! If you are struggling to brainstorm low carb ideas and want something easy, this was tailor made for you. If you are on the keto diet or just trying to cut back on carbs, you will get a lot of value out of this cookbook. Access Lunch in Five from any device! What are you waiting for? Make lunch the easiest part of your day! Get Lunch in Five instantly! When will I get my eCookbook(s)? Instantly! Your order confirmation page will have the download link(s). They will also be emailed to you! How many recipes are in each eCookbook? 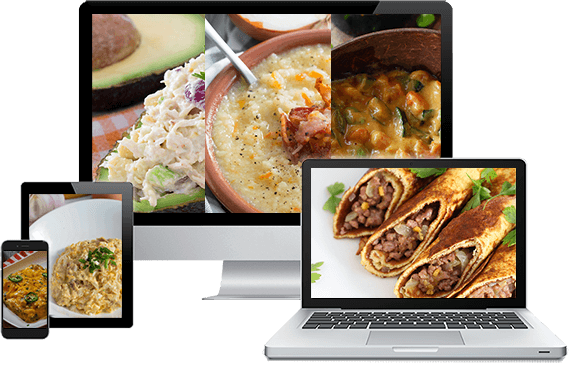 Each of our eCookbooks contain 30, easy to follow, low carb recipes. Is each recipe low carb? How low carb? Are the recipes easy to follow/make? Each and every recipe has only 5 common ingredients and 5 easy steps! We try our best to keep our recipes simple yet delicious. That means no frilly ingredients – we stick to the basics so your meals are cooked quickly and enjoyed immensely. Do the recipes contain any hard to find ingredients? With only 5 ingredients to work with, you can be sure we’ll be using the freshest, most whole ingredients that are big on flavor, not on difficulty. How many servings do the recipes make? Most of the recipes will make 2 servings unless otherwise stated. Are these eCookbooks suitable for vegetarians? Since we are geared toward and follow the low carb and ketogenic diets, which allow meat, most recipes are not suitable for vegetarians. We are working on a vegetarian keto eCookbook, so stay tuned for that! Are the recipes all gluten-free? Because we are low carb, we DO NOT eat foods like pasta, bread, flour and other wheat products. All of the recipes are gluten-free, though please make sure to use ingredients like gluten-free soy sauce, baking powder, etc. Those can have hidden gluten so read the label carefully before buying! Do the recipes contain dairy, eggs or nuts? Many of our recipes will contain dairy. 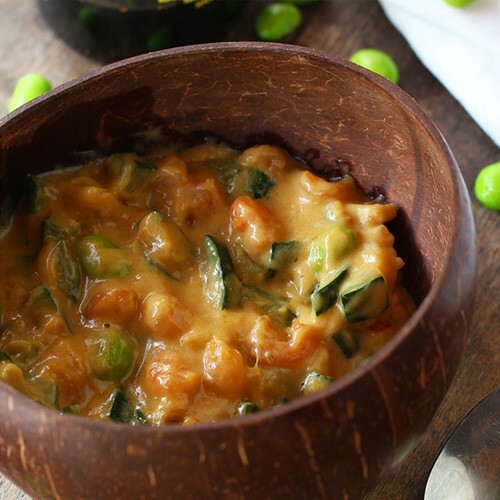 Many of our lunch recipes contain eggs or dairy and a few will include some nuts. Who do I contact if I have any other questions? Any questions can be sent via email to hello(at)tasteaholics(dot)com or through our contact form prior to or after purchasing. We’re always here to help! I have two computers I actively use and an eReader device. Can I read the eCookbooks on all of my devices? Of course! You are allowed to transfer/share your eCookbooks between any and all devices that you own. Join thousands of successful dieters today! 2018 © Tasteaholics, Inc. | TryLowCarb.com powered by Tasteaholics. Get the Keto in Five Bundle Over 40% OFF! 120 Recipes - 5 carbs, 5 ingredients each.